In the Pacific, Russian-made bombers come in low. In Europe, Russian infantry divisons strike aircraft and tanks begin to move. All are pointed toward the Fulda Gap. And World War III begins. First appearance of General Douglas Freeman who is destined to become as legendary as George Patton. 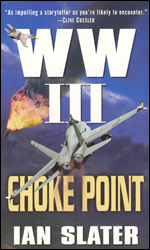 "Superior to the Tom Clancy genre...and the military aspect far more realistic." From beneath the North Atlantic to across the Korean peninsula, thousands of troops are massing and war is raging everywhere, deploying the most stunning armaments even seen on any battlefield or ocean. NATO armored divisions have escaped near defeat in the Russia-ringed North German Plain. The once formidable Russina assault falters and NATO forces struggle to end this worldwide conflagration. It's Russina quantity versus American quality. 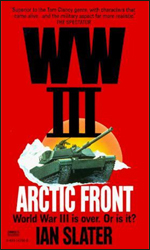 In the worst Siberian winter in twenty years, blizzards are wreaking havoc with U.S. cover, and it is up the unorthodox U.S. General Freeman to hold this artctic front. General Cheng is massing divisions on the Manchurian border while Siberia's Marshal Yesov readies his army on the western flank. If successful, this offensive will drive the American-led U.N. force into the sea. 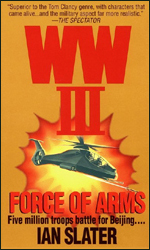 U.S. General Freeman reveals his tactical as well as his strategic brilliance. At Manzhouli, near the border of China, Siberia, and Mongolia, the Chinese launch their charge into the woods. It's all-out war, and only the brave and ruthless will survive. Four sleek Tomahawk cruise missiles are headed for Beijing. It is Armageddon in Asia. 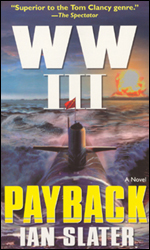 On the South China Sea an oil rig erupts in flames as AK-47 tracer rounds stitch the night and men die in pools of blood. 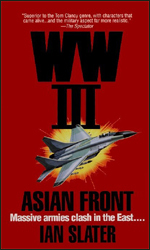 From Japan to Malaysia, the Pacific Rim is ablaze in a hell called WWIII. A series of cataclysmic events is exploding around the world. Two divisions of Chinese ground troops move against a neighbouring Muslim nation, while a provocation unleashes generations of pent-up violence between the mainland and Taiwan. With U.S. troops still on the ground in the Middle East and "Ganistan," and an American president forced by rapidly unfolding events to make decisions on the fly, the most dangerous threat is the one no one sees. 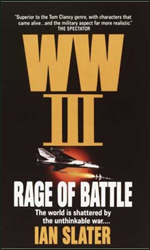 For off the fog-shrouded coast of Washington State, a staggering attack will flood the Northwest with American refugees and force the bravest and the best of U.S. Special Forces under the toughest of the tough, General Douglas Freeman, into a pitched, desperate battle to find a shadow enemy - before he strikes the next terrifying blow against the United States. Three terrorist missiles have struck three jetliners filled with innocent people. America knows this shock all too well. But unlike 9/11, the nation is already on a war footing. The White House and Pentagon are primed. All they need now is a target and someone bold --- and expendable --- enough to strike it. 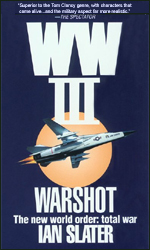 In a bold and devastating move against the United States, terrorists have hijacked Project Darpa Alpha, classified advanced technology that puts America at the terrorists' mercy. The White House is stunned at the magnitude of the assault. 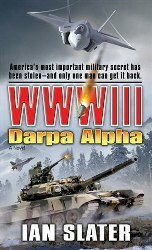 General Douglas Freeman has already tried and failed to stop the enemy from transporting Darpa Alpha off U.S. soil. Now he's about to get his second - and last - chance. U.S. intelligence has traced the theft to a terrifying military state-within-a-state on the Sino-Russian border. Moscow is willing to turn ablind eye to a retaliatory U.S. assault, and the president has the perfect hero - or the perfect scapegoat - in Freeman. With 1,400 marines on the edge of an eerie, forbidding landscape, Freeman has a career to redeem and an enemy to defeat. But the bad guys have the means and motivation to turn Freeman's lightning strike into an icy swamp of death - with a terrible new world order waiting on the other side of war. It's brother against brother, citizen against citizen, soldier against soldier--in a war for the soul of America. 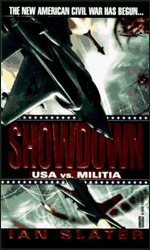 SHOWDOWN is the heart-pounding scenario of a war that could be coming . 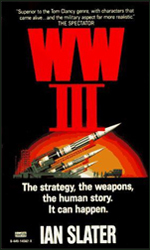 . . a war in which both sides possess the most advanced and terrifying weapons in the history of combat. . . . The militia movement is spreading like wildfire --- more violent, more organized, and more committed than ever to an armed victory over the United States. BATTLE FRONT is the terrifying story of home-grown terrorism on a grand scale. The United States Militia Corps, fighting for its life, pulls off a daring hospital breakout of two injured soldiers. An all-out chase across the desert leads to a showdown at the California state line, where transporting kidnapped hostages becomes a federal offense. And Federal General Douglas Freeman is waiting for the word to get back into the fight. 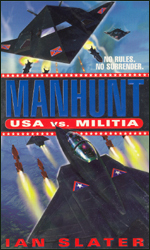 MANHUNT is a wild ride into the heart of America's Second Civil War, but this time with high-tech modern weapons and tactics that threaten nation annihilation. Someone has hijacked one of America's most important military secrets and it could mean the destruction of the United States. 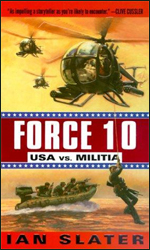 FORCE 10 is the gripping story of a deadly conspiracy launched against America and the elite soldiers who will risk their lives to stop it. 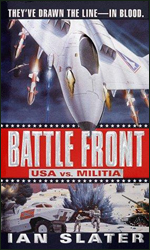 In the war between the USA and the Militia, General Douglas Freeman and master guerrilla strategist "Lucky" McBride are each fighting for complete victory at any cost. While Freeman has won round one, putting McBride's top soldiers behind prison fences, McBride and the Militia are most dangerous when cornered--and they're about to strike back. 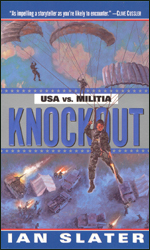 KNOCKOUT is the thrilling fifth book of the compelling USA vs. Militia Series. Six hundred million gallons of high-octane fuel poured on the wind-swept waters of British Columbia. One match will ignite a raging inferno. Burning with the fury of hell --- nothing will stop it. A blazing inferno of terror ---- totally out of control, threatening the coast of Canada and thousands of human lives! An environmental disaster torn from today's headlines! A startling rescue operation. A gripping, shockwave novel of total suspense, horror --- and surprise. "In the right place at the right time with the right story." "An excellent book...There's something for everyone in the plot." "A good, powerful, readable, terrifying, inescapable story." Riches at the bottom of the sea...west of British Columbia. Within hours, lives become intertwined in a perilous game of greed and ambition, some looking for glory, others looking for riches. 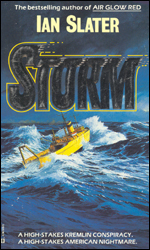 Against a violent, raging sea storm, the crews of three ships resort to espionage, sabotage, and murder, each hoping to claim the sea gold as theirs. Who will survive the storm? Who will win the race where there can be only one winner, where coming in second means coming in dead? 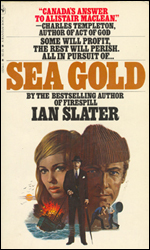 "Thrilling, fast-paced...Sea Gold combines a high sense of adventure with excellent character and story development....An out-and-out winner." "A first-rate, crisply told adventure story." "One of the top suspense writers in North America. His plots are intelligent, well thought out, and have the eerie specter of reality hanging over them like a rain cloud on the horizon." "Provides page-turning thrills that should leave even the steadiest hands shaking." "One of the most riveting chase sequences in recent fiction." USS New York. 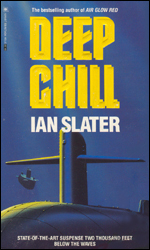 A sixteen-thousand-ton nuclear Trident submarine lies like a giant metal coffin on the floor of the icy North Pacific on the U.S.-Soviet border. Trapped inside are its dying crew and the Pentagon's most vital secrets. The Russians want her. America wants her back. It's an impossible mission only one man dares to accept. In the eye of the storm the final confrontation arrives. 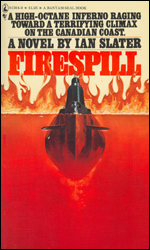 A devastating plot sweeps from Moscow to a desolate island in the Pacific Northwest --- where an SS-18 missile launcher threatens to bring America to its knees --- and Oceanographer Frank Hall must risk his life and the woman he loves to stop the unstoppable...before it's too late. "The moment might very quickly come for us to use a weapon with which we ourselves could not be attacked." Adolph Hitler, Danzig, 1939. In June 1944, the moment had come. The Allied pincers were closing in. 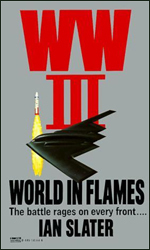 Hitler had already ordered his jet fighters and his V-1 and V-2 rockets into action. Now it was time for the Fuhrer to use the most secret weapon of all. A bilingual American agent raised on the Canadian/U.S. border is parachuted deep into France to discover what the new secret weapon is. It is not the atomic bomb, but something which many Allied experts predict will be far worse. 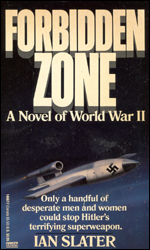 Based on little-known true events of World War II, Forbidden Zone is a tense, page-turning thriller of espionage, sabotage, and betrayal. It is 1942 and Japan owns the Pacific. The speed with which the Japanese have captured vast territories in a few months makes the Nazi Blitzkrieg look plodding by comparison. Hundreds of thousands are taken prisoner as Americans in the Philippines and the British in Singapore are forced to surrender, and President Roosevelt orders MacArthur to escape from the Philippines to Australia, from where he can launch a counteroffensive---hence MacArthur's famous promise "I shall return." Japanese War Minister Tojo orders that MacArthur be assassinated. 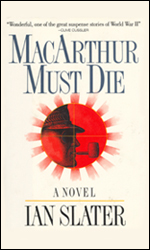 MACARTHUR MUST DIE tells the story of an ingenious assassination plot involving a naval weapon which the Allies did not possess and which was twenty years before its time. "A high-noon shootout in downtown Brisbane, which produces a denouement straight out of Higgins's The Eagle Has Landed. 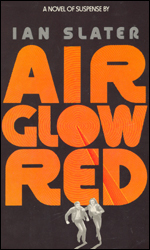 As a native of his narrative's Australian setting Slater is also able to offer flashes of local colour." "A most satisfying what-if thriller...The plot [is] a full-speed-ahead page-turner....Flashy, fast fun." 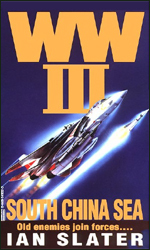 "Wonderful; one of the great suspense stories of World War II." "Searing suspense...[A] rousing, splendidly told adventure." "Taughtly written, this novel is loaded with scenes that will have you grasping the book so tightly your knuckles will turn white....The final scene is a climactic hair-raising thriller." 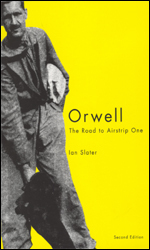 "It is doubtful that any book provides a better foundation for a full understanding of Orwell's unique and troubling vision." The Official Ian Slater Website and Ian-Slater.com � 2003 Ian Slater and Connie Chang. All Rights Reserved.